What is an RFC form? RFC forms are used mainly by Disability Determination Services (DDS). An RFC form is a Residual Functional Capacity form. The purpose of an RFC form is to rate the residual functional capacity of an individual. RFC forms are used mainly by Disability Determination Services (DDS). 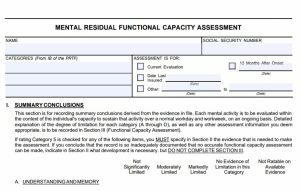 A Residual Functional Capacity form is basically a summary of your ability to perform certain tasks. 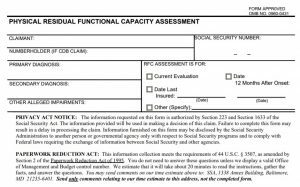 When you file a claim for Social Security Disability Insurance (SSDI) or Supplemental Security Income (SSI), a DDS examiner will review your medical records and will either approve or deny your claim. However, before your case can be closed, the examiner must take your case to a DDS medical or psychological consultant and have him/her complete an RFC form. This RFC form is filled out by a DDS doctor that has read your medical records but has never examined you. At the time of a hearing before an administrative law judge, you can present an RFC form to a judge that has been completed by your physician rather than a DDS medical or psychological consultant. Having a detailed RFC form filled out by your doctor will greatly increase your chances of winning your disability hearing.